Tiny Farm [Free] is the latest offering in this popular genre, and I’m just gonna say it right off the bat so I don’t feel like I’m holding back: It looks a billion times better than FarmVille. It trades in the deformed character style that makes you feel like you’ve stumbled into an avatar generator for a clean cartoon look, and I admit it made me like the game ten times more right off the bat. The cute little sounds the animals make when they get all swoony over you for feeding them in pretty great, too. As far as gameplay goes, it will be very easy for any person who has played this type of sim before. You start off simply with a small plot of land, a shop to buy things from, and a basic tutorial which will show you how to grow crops and adopt animals. You’ll start off with a few sheep, learn to breed them, and soon enough you’ll be a regular master, mixing breeds and so on. One mentionable here is the menus, which are just as clean as the gameplay and make it a pleasure to play Tiny Farm. Since these types of games rely so heavily on menu interface, this gives the game a little boost and makes you want to keep on playing. So how do you make your farm bigger and better than anyone else’s? Well, by doing things such as upgrading your house, breeding bigger and better animals like pigs, cows and fancy roosters, and expanding your land. To do these things, you’ll need to spend time in the game — there are some processes you can hurry along with items like Bells, which make animals instantly level up, but other things you’ll simply just have to wait out. The good news is, while you wait you can fill your land with all sorts of decor, from trees to statues. By the time you’re done, you can harvest some crops and check on your animals, and you’ll be well on your way to expanding your universe. Part of the allure of these types of games is sharing your country with your friends so you can brag about how vast it is. Since Tiny Farm is Game Center enabled, people can check there to see how fast you are progressing. 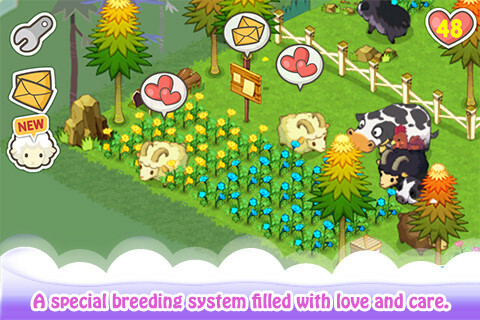 You can also use a message board to leave messages for other visitors to your farm, or you can also back into the world map and use it to invite friends using the game’s built in system. Just like FarmVille, there will be certain quests later down the line you’ll need help with, so you’re best off making some pals so they can come over and water your lawn or whatever it is people do in this crazy world where people just tend farms and build things for fun. I’m kind of jealous, honestly.